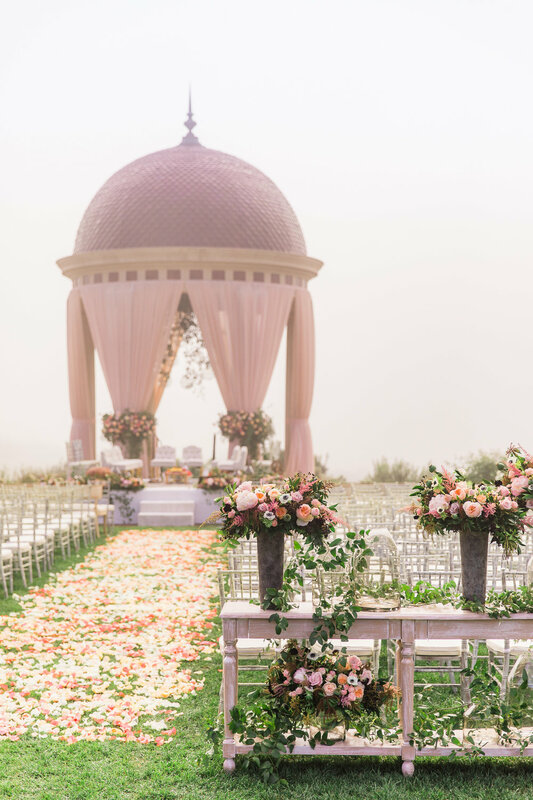 We are still obsessing over this Pelican Hill wedding. Every aspect of the celebration was executed flawlessly. The floral design varied from pink peonies to an abundance of greenery, and everything in between. 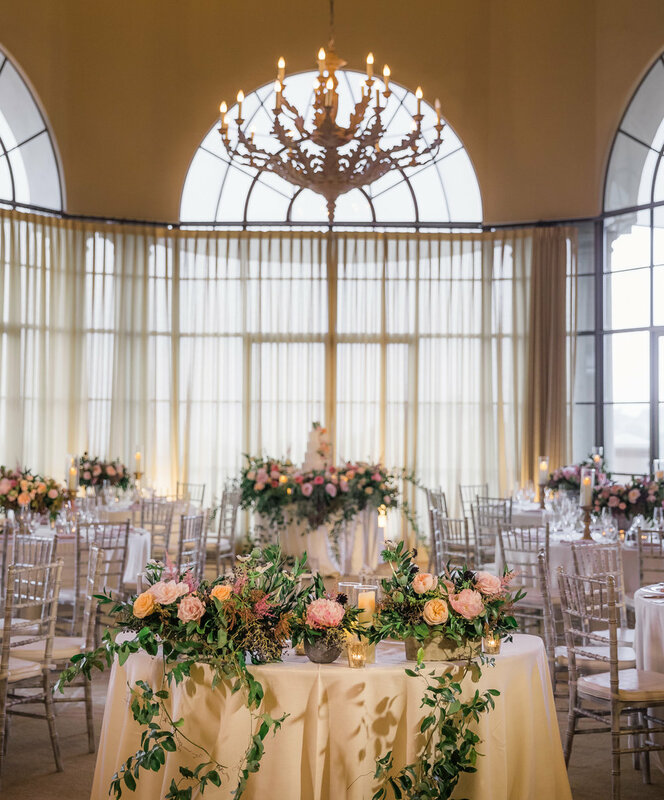 The rotunda where the couple said “I do” was decorated with large floral arrangements and featured a chandelier-like large statement of greenery. The pink curtains tied into the color scheme and inspiration for a garden-themed wedding. Flower petals were scattered down the long aisle and were also in shades of pink. Table top floral arrangements were dispersed around the ceremony area and added a rustic garden feel to the ceremony. Shades of pink were incorporated with large candles on every table. The reception area reflected the ceremony décor flawlessly. Chandeliers hung from the ceiling and added glam to the design. 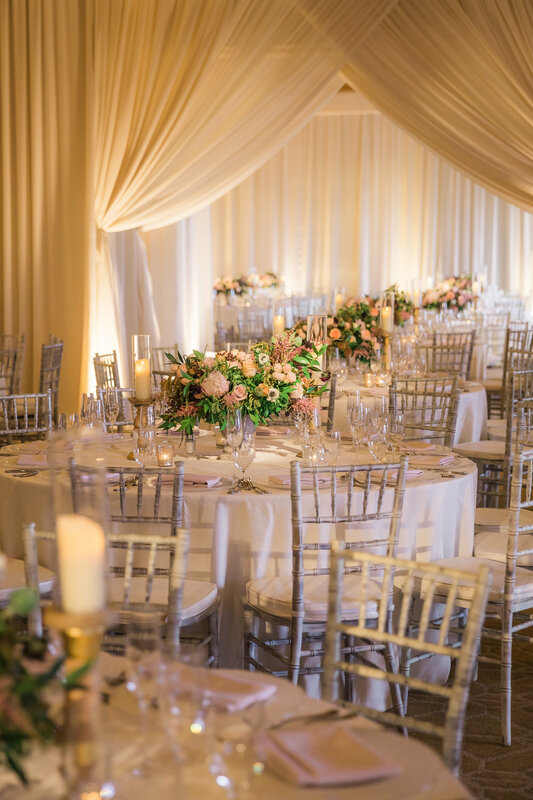 The peachy pink color was perfect for this California wedding. It had a non-traditional vibe that accented the garden aesthetic perfectly. The subtle pops of coral color were the perfect details The organic feel of this wedding design was refreshing and inspiring. Our team could not stop obsessing over the color palette and design elements that we incorporated flawlessly into this wedding design. 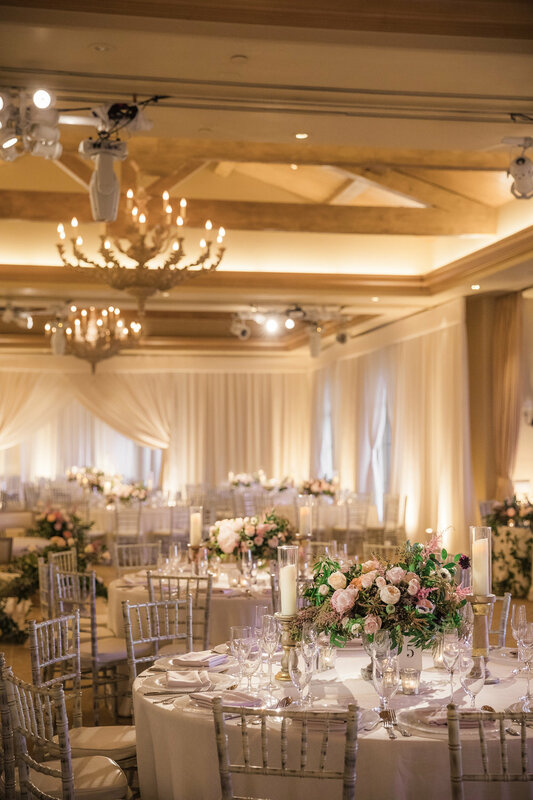 The newlyweds loved their celebration and enjoyed making memories with all of their loved ones amid a bounty of fresh and fragrant design elements. At the reception, table centerpieces reflected the floral arrangements from the ceremony and were a mixture of pink roses and lots of greenery. This was one of our favorite projects to create and we were so inspired by the scheme of details that came together to create an overwhelmingly beautiful celebration of love. The newlywed’s six-tier cake was even detailed with peonies in shades of pink. Each place setting had a peony placed on it and was an extra detail that did not go unnoticed. Candles illuminated the reception area and runners of pink florals and greenery lined each long table.